This Staff Handbook is a 36 page document in 27 sections setting out the rights and duties of both employer and employee and the employer’s policies and procedures in relation to all personnel matters, including disciplinary and grievance procedures. This Handbook is designed for use by employers in England and Wales. This is a scene setter. 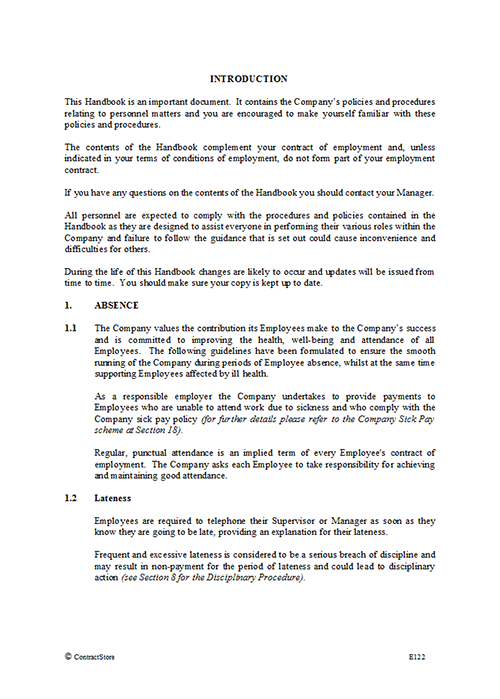 In a long document, it is important to let the reader know that the Staff Handbook will not form part of the employees’ terms & conditions unless so stated in the employment contract. 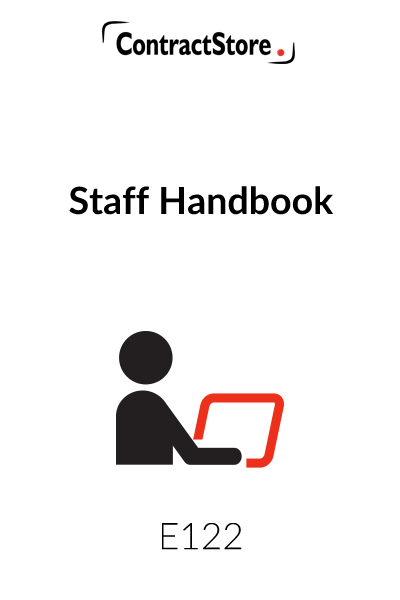 The Staff Handbook can be as long or as short as you want it to be. 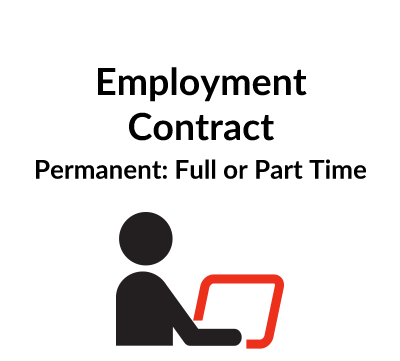 Most employers will prefer to have a shorter terms & conditions of employment and a longer staff handbook. But this does not mean all the clauses here will be relevant to your business. Some may be relevant, some not and others may need tweaking to reflect your business. Because of numerous statutory and common law provisions, this Staff Handbook covers the main issues commonly come across. It does not claim to cover all scenarios and if your company wants to do this, the document will be a lot longer and you should take legal advice. This clause may need tailoring to your business, specifically with regard to, for example, the size of the business. This clause is from the side of the employer, and some parts of it are drafted specifically to protect against malingering. It is quite onerous on the employee and may or may not need to be toned up or down depending on your needs. Return-to-work interviews are recommended as a record of why the employee has been absent, so that the employer has evidence that the absence was not caused by their actions. Furthermore, it is useful to have a record of any potential disabilities that may arise, which the employer is liable from that moment to be aware of, monitor and possibly make reasonable adjustments for (see clause 1.8). This clause does touch on the duty under the Equality and Disability Discrimination Acts to make reasonable adjustments. Termination for long term sickness needs to be considered very carefully as it will usually be disability discrimination unless it can be justified objectively and reasonably. Please take legal advice if you are considering this. You do not have to allow employees to undertake additional employment. If they are full time for example, you would be justified in saying they could not undertake any other employment. It might be less reasonable to do this if the employee is part time. This reflects the statutory minimum entitlement. Please note also that it caters for part time employees who normally do not work on days when bank holidays normally fall (for example Mondays). These employees will receive a pro-rated entitlement in lieu to bring them up to their normal entitlement, depending on how many days they do not benefit from those normal bank holidays. 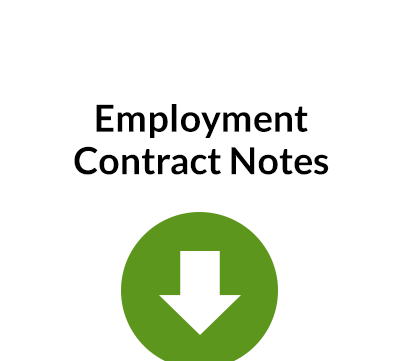 There is no statutory obligation on the employer to give appraisals but they are a useful way of monitoring employees and recording information for future use. For example if the employer finds themselves in a situation where they need to make redundancies, the appraisals can be used to score within any given pool of employees. Appraisals may be useful also when assessing bonuses, salary reviews and disciplinary procedures. Again, this is not mandatory but may be useful (especially in larger companies). This goes hand in hand with the disciplinary procedures in clause 8. This speaks for itself and reflects the statutory position. Employers have an obligation to protect employees from harassment, not only from colleagues but from third parties as well. This clause in the handbook is proof that the employer is aware of this obligation and, by keeping an eye on this, the employer will gain evidence in any grievance or claim against them for harassment. Statutory disciplinary & grievance procedures do not exist anymore. However, good practice dictates that a similar process to that which was once the legal requirement is still reasonable. This procedure reflects suggested reasonable practice. This can be toned down for smaller businesses but it is important to give the employee a reasonable hearing in both circumstances. This may not be applicable to all businesses but it can be left in anyway, even if the employer does not offer training. This clause acts as a sort of addendum to the disciplinary process, that the employer expects the employee to act in a certain way at all times. This clause reflects the statutory position about equal opportunities and the obligation not to discriminate on statutory grounds. It is not mandatory to set this out (since it exists anyway) but it is very useful to have it in writing and agreed by employees when they start employment since, in the event of a claim for discrimination, it will help the employer if they have Equal Opportunities policies in place. Training on a regular (say annual) basis will also help illustrate this for the employer, if applicable. This clause speaks for itself. This may or may not be relevant to your business. It can be taken out if you feel there is no opportunity for home working. However, please note that you are still bound by the statutory conditions regarding requests for flexible working, which includes requests to work from home. These will need to be considered in line with the statutory process, as set out at clause 24.5. Again, this may or may not be relevant to smaller businesses. However, it is a useful tool if for example you want to impose a probationary period into your employment contracts, as a way of monitoring how new employees are connecting to the business. This is a statutory right in any event and, although strictly speaking it does not need to be in the handbook, it serves as a useful reminder that any attempt to contract out of a statutory right will be void. Because this changes so much from business to business (and indeed employee to employee) it is better to set this out in the employment contract. This reflects the Equal Opportunities section 11 and general reasonable employer duties. This section is left blank/ drafted with suggested numbers of days, for the employer to fill in. You are not obliged as an employer to pay any salary in full or at all during periods of absence for sickness. However most employers would usually offer a few days on full pay as arranging Statutory Sick Pay for a few ad hoc days here and there is a logistical issue. Therefore, most employers would offer a few days (non-consecutive or consecutive in any one period) on full pay. Some may then offer a sliding scale of a few more days on, for example, half pay. It is entirely up to the employer to decide what they want. A smaller employer will usually offer fewer days’ full pay than a larger employer. A few days’ pay in full for sickness might also help an employer in the event of a claim for disability discrimination or personal injury. Larger employers may have permanent health insurance schemes which they can refer to here instead of this. This reflects the statutory situation. This reflects the duties of a reasonable employer according to current employment law. You may want to tone them down a bit (within limits that may be set by law at any given time, for which you must take advice) or extend them in the case of a bigger employer. Larger employers may even add these days to the paid sickness provisions. This is an increasingly contentious area of the law and it is advisable to have some policy in place, either within the handbook or on its own. If you do want to keep in the monitoring provisions, it would be best to get some confirmation from the employees that they have read the handbook. In fact, it is a good idea to get this in any event and an email by a certain date to say this is sufficient, on the understanding that, if the employees do not reply, their consent to its terms will be implied. This is because email monitoring is usually illegal if the employees do not know about it. Again, this clause is self-explanatory and can be toned down or expanded according to business needs. This is not a mandatory clause to have in the handbook but it is a good idea to have something in there, in the event that an employee makes a whistleblowing claim. A claim at tribunal for unfair dismissal due to whistleblowing does not need the requisite two years’ qualifying period. This clause covers the main areas of working parent regulation. There is a myriad of different scenarios available to working parents and they change all the time. This handbook only gives the main ones. The rules are statutory rules anyway, so they will apply to all employees regardless of whether they are in the handbook or not. These are just a guide. If you want to put in all the provisions, you will need to take advice from a lawyer. Alternatively it is also acceptable to tone these down on the advice that you mention that these are the main provisions only. Broadly speaking, the amount of SPL that is available to each parent will be how much they decide to share between them once the total amount of maternity leave or the total amount of the maternity pay or allowance period is taken into account, although each employee’s circumstances will need to be worked out individually between the employee and their partner. A mother who is entitled to Statutory Maternity Leave, SMP, or maternity allowance (which applies if you don’t qualify for Statutory Maternity Pay: please see https://www.gov.uk/maternity-allowance), must curtail her entitlement so that she and the child’s other parent may share the balance of the leave, pay, or allowance period as SPL. A notice that requests one continuous period of SPL must be accepted but where a notice requests discontinuous periods, we have two weeks to accept the request, propose alternatives or refuse it. Where we refuse the periods requested, the Employee may choose to take the total amount of leave requested as a continuous period or withdraw their original notice. An Employee may serve up to three notices. 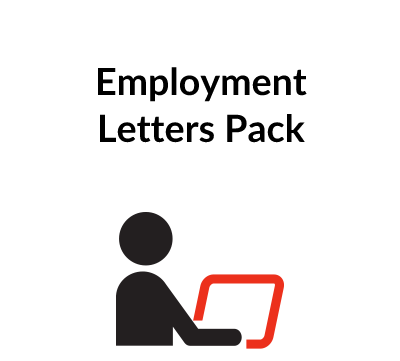 As currently happens during statutory maternity, paternity and adoption leave, an Employee taking SPL will be entitled to the benefit of the terms and conditions of employment which would have applied had they not been absent, except for the terms as to remuneration. An Employee wishing to claim ShPP must have been continuously employed with the Company for a period of not less than 26 weeks ending with the 15th week before the EWC and have earnings during the last eight weeks of their employment prior to the 15th week before the EWC of not less than the lower earnings limit (£112 per week for 2015/2016 tax year). The Company will comply with all statutory requirements.